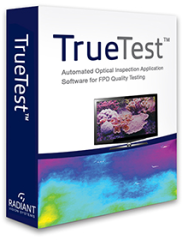 Radiant Vision Systems is a global provider of automated test & measurement solutions. Manufacturers of electronic devices, displays, lighting, backlit components, and assemblies need accurate, repeatable, and easy-to-use measurement solutions to ensure product quality, generate data, and improve efficiencies. Radiant Vision Systems offers a broad portfolio of automated visual inspection products, including imaging photometers and colorimeters as well as software, to measure, characterize, and inspect light, color, assembly integrity, and surface quality in the lab or on the production line. The company’s specialized CCD-based systems help manufacturers gain a competitive advantage in today’s marketplace, where margins are thin and customer expectations high. Based in Redmond, WA, USA, Radiant Vision Systems has proven production experience with thousands of cameras testing millions of components. The company's extensive product portfolio includes TrueTest™ Automated Visual Inspection Software, ProMetric® Imaging Colorimeters and Photometers, and goniometric systems. Radiant Vision Systems enables you to truly See The Difference™.